Low carb tortilla wraps, vegan! These low carb tortilla wraps are probably my favorite type of low carb bread. They are very quick and easy to make because they don't use yeast and don't need time to rise. You cook them in a pan, so you don't even have wait for the oven to preheat. This recipe makes four large wraps that each contain 4-5 grams of carbohydrate. You can replace some or all of the soy flour with protein powder to lower the carb count to 1 à 2 gram per wrap. The wraps freeze and thaw quite well, so you van make a large batch and keep the leftovers for easy future meals. You can use these for all the things where you would normally use carb-filled wraps. Fill them with a salad, tofu scramble or chili. Or make quesadillas, burritos and enchiladas! These wraps have a nice authentic bread taste, but you can give them more flavor by adding herbs and spices to the dough. Mix in some garlic and cumin for an Indian roti flavor, or add some thyme and marjoram for an Italian flatbread. You can make the wraps with or without the wheat bran and/or almond flour. Adding them gives you a 'whole wheat' kinda feel, leaving them out makes the wraps more white-ish. Leaving out the gluten would make the dough a lot harder to roll out. I'm still working on making a gluten free flatbread. Put the dry ingredients (soy flour to salt) into a bowl en mix them well to get rid of any clumps. Add the water and olive oil and stir with a for until it forms a dough. Knead the dough for a minute or two with your hands and then form it into four balls. Dust a rolling pin and your work surface with some soy flour or protein powder. Flatten one of the little dough balls, and roll it out to make a large very thin wrap with a diameter of 25 to 30 cm (not larger than the bottom of your skillet). Dust it with more flour if it sticks. It's okay if it doesn't become perfectly round. The dough will contract a little. That's okay, just roll it as thin as possible. Preheat a large skillet on medium high heat (don't use oil). Put the freshly rolled wrap into the pan and cook it for one or two minutes until the bottom has dark brown spots. Turn it over and cook the other side until it also has dark brown spots. Watch carefully so it doesn't burn. Keep rolling and baking your wraps until all four dough balls are used up. One large wrap (of 4) contains about 147 kcal, 8 g fat (1 g saturated), 4 g carbohydrate, 4 g fiber and 13 g protein. This sounds perfect but im allergic to soya. Was wondering if u might have suggestions. Thx! Hi Farzana, I think you can replace the soy flour with most types of neutral tasting protein powders (pea, hemp, rice etc.). Or, if it doesn't have to be super low carb, you can use chickpea flour instead. You may need to experiment a bit with how much water you add, but otherwise it'll be just fine. 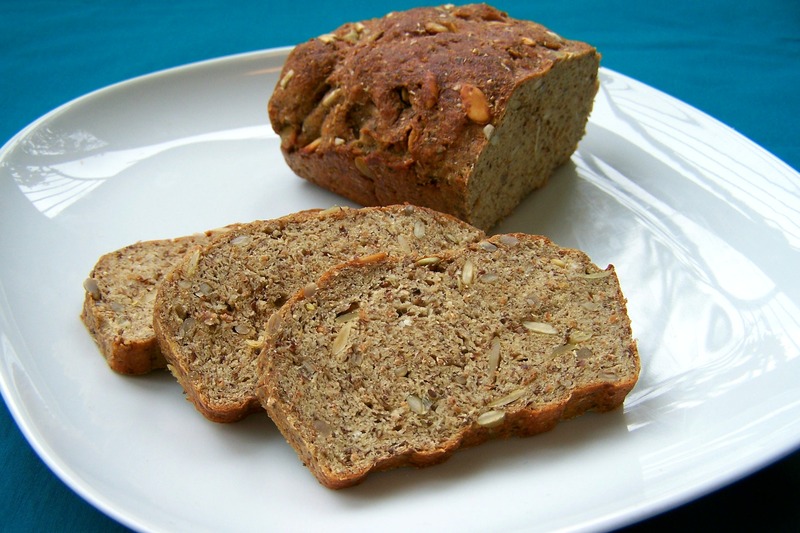 What can I replace the vital wheat gluten and almond flour with? I'm allergic to gluten and almonds and have been looking for a low carb vegan wrap recipe for ages. Hi Amanda, the gluten is very important for the structure of these wraps, so it is difficult to replace it. 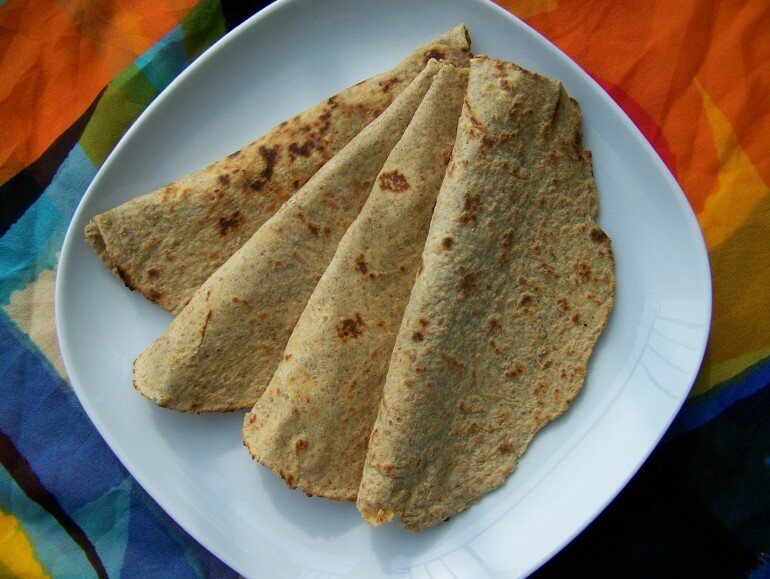 I think this recipe might work better for you: http://healthyindulgences.net/2008/07/homemade-low-carb-gluten-free-wraps-you-can-do-it-too/ Almond flour can be replaced with any type of ground nuts or seeds that you are not allergic to. I made these last night and they were incredible. Thank you so much! That's great to hear Jacq! Thank you. Hi Emily, wheat germ will work just fine. Enjoy the recipe! These are delicious!! I just made them, but i didn’t have soy flour, so I used almond flour instead. I also added the extra 15g almond flour. Since I didn’t have a good powdery flour for the rolling, I used olive oil and rolled between 2 silicone mats. It was still sticky, but I made it work. The only problem I had was that they were completely crispy. I am currently eating them as chips with salsa and I can’t get over how good they are, but I’m wondering why they are crunchy. They’re not burnt, but they are slightly browner than in your photo. I may have cooked them a little too long, or could it be the almond flour? In any event, thanks for the recipe, I’ll definitely make them again! His Jessica, happy to hear you like the recipe so much! Since you say yours were a little darker than mine, I'd say try to cook them on lower heat and a bit less long next time. It also helps to cover them with a clean tea towel when they come out of the pan. That traps the steam, so they stay softer.